Crimson Trace LG-447 LG-447 Laser Guard for Taurus Slim FREE SHIPPING! The Crimson Trace LG-447 Laser Guard for Taurus Slim is the marksman's choice when it comes to precision and performance that is unmatched. Choice compact pistol carry-friendly firearms Taurus PT 709 and PT 740 (aka Slim) have met their perfect mate in the LG-447. The intense shine of the laser allows for its carrier to feel confidently protected, especially considering it is small enough whether or not your concealment choice is a pocket or a holster. The LG-447 Laser Guard, when drawn, has an activation that is instinctive so it is automatically ready to strike when you are. Crimson Trace guards are factory sighted at fifty feet and maintain the ability for the owner to adjust for windage and elevation accordingly. LG-447 Lasers come with a three year full warranty. 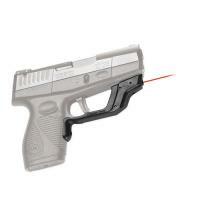 ©2002-2019 CopsPlus.com: Crimson Trace LG-447 LG-447 Laser Guard for Taurus Slim FREE SHIPPING!